Riddle : SARL Maxima, Specialists in the sale and reparation of machines and accessories for the construction industry. Importer and distributor of both hydraulic and pneumatic equipment. 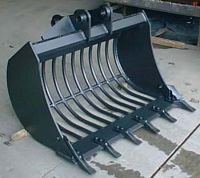 A riddle bucket is used for sorting rock or stones from earth. 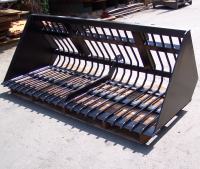 Mainly used for riddling stones from soil heaps, sorting through piles of rubble etc. 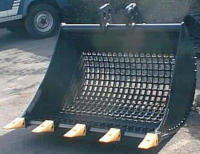 Popular with landscapers for clearing banks and for digging rather than sorting through piles of material. 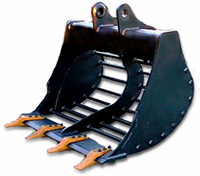 Used in quarries and for top soiling where exact product sizing is critical for a premium product.